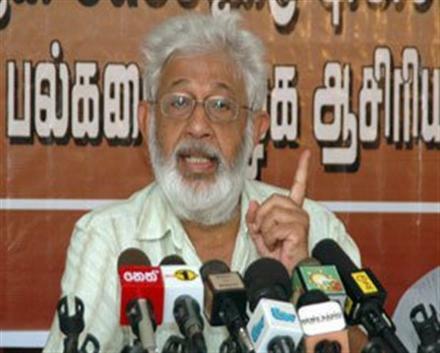 The originator and a figure who consistently lobbied for the Single Issue (abolition of the Executive Presidency ) Common Candidate concept – Professor Kumar David has called upon the National Movement for Social Justice (NMSJ) and all others backing Common candidate Maithripala Sirisena to withdraw their support unless he amends the manifesto immediately to include the abolition of Executive Presidency. In an email, Professor David has condemned the absence of the promise to abolish Executive presidency in Sirisena’s election manifesto, which he has requested to be read at the NMSJ national conference that is due to be held on Tuesday (23). “The people cannot and should not forget the treachery that they have been subjected to four times previously. I call upon the NMSJ and all others to withdraw support for Mr. Sirisena unless he amends the manifesto immediately. I strongly urge the public to accept no excuses for this betrayal,” he has written. Meanwhile, Colombo Telegraph also learns that clashes and disagreements have erupted among those involved in the common Opposition movement over the wordings in Sirisena’s manifesto regarding the abolition of the Executive Presidency. “It is the President who should provide the leadership to get the Constitutional Amendment approved by Parliament. I decided to contest the Presidential election as the common candidate of the people to complete that task. We were unable to constitutionally change the Executive Presidential system that is in force since 1978 though we promised the people and the country to do so from 1994 up to date. Our inability to achieve that objective was a great failure on our part. It cannot be delayed any longer. The President needs the assistance of the Parliament to change the post of Executive President. That is because it is the Parliament which has the power to amend the Constitution. yet the Parliament was unable to effect this change for the last twenty years. It is the President who is the leader of the main party that should provide the leadership to pass the Constitutional Amendment with a two-thirds majority. For that the President should take the initiative to reach an accord among main political parties. It is to fulfil this task that I decided to come forward as the common candidate of all the people at this Presidential election. I can obtain the support of the Members of Parliament of the Sri Lanka Freedom Party that has the majority in Parliament. Also the United National Party has signed an agreement with me to effect this amendment. The Janatha Vimukti Peramuna has agreed with our Party to do so since 1994. The Jatika Hela Urumaya has signed an agreement with me to support this measure. Therefore I will discuss with other parties and pass this amendment without fail within hundred days. In order to change the Executive Presidential System I am taking as background material agreements for abolishing the Executive Presidential system reached by the Movement for a Just Society headed by Venerable Maduluwave Sobhitha Thera as well as the proposals contained in the Draft 19th Amendment compiled by the Pivituru Hetak Jatika sabhava headed by Ven Atureliye Ratana Thera which proposed a Constitutional alliance of the President and the Prime Minister. I will also consider the changes proposed to these proposals by the United National Party. So lets not support Maithripala and let MaRa win again. This is Tamil logic unfortunately. They did this in 2005 and look what happened to Tamils! If you want to live in this dictatorship, How can you survive? If you look at the latest article by Kumar David, He said that he mistook the word, because the translation of manifesto went wrong and now another MP helped Kumar David to re-check the manifesto. Clearly the manifesto has mentioned that during 100 days of Maithri’s programme he will abolish the executive presidency with the request of 2/3 majority or a referendum. Think twice before voting, If you voted for Mahinda and he will continue to take the entire control of the Government and remove the rights of people, politicians and law which will lead the country into autocracy, The president will become the all powerful and the one family ruling country. So this means people like you muslims will suffer dynamically and their rights will be completely eliminated. Therefore when the autocracy Government unleashes the ultra-nationalist movement such as BBS, will make the muslim community’s life unstable on daily basis. They will continue to destroy the mosque, muslim-run schools and muslim-run businesses. Each minority will not have freedom under present Government. You cannot blame tamils for what they did in 2005, It was the Rajapaksa who did these he strikes an agreement by giving LTTE leader over $50M to block the tamil voters from voting for the presidential candidate. All you have the rights is to vote for the opposition candidate where they’re considered as freedom fighter, solution to minority and economist expertise. This will be only the deadliest chance for the minority to vote for right president. So, so, do not vote for MR and also do not vote for Mithiri . Something is not right here. If many people boycott the election MR will win. 1+1=2 = MR money. Very difficult to trust any one with a tamil name. Any how he is a Karuvathoda man, greedy for money. In my opinion, when a man voices an idea, he should not be insulted with motives, which is typically Sri Lankan. If Prof. Kum. now regrets his choice and admits deception or he did not foresee something then he is to blame for not crossing the road without observing the vehicular traffic flowing either side. The reality of the matter was is Sri Lanka has had enough with the Executive Presidency which can be even an Executioneering Presidency. Prior to that we had an Executive Prime Minister-ship for which the voters in 1977 had enough of it, resulting in the birth of the Executive Presidency. The rationale of the then leaders were that with a history of cross-overs there could be no stable Government, etc. etc. There has to be some change but can this be done in 100 days! Tinkering with a constitution is no laughing matter. Why bother? Dr. KD is a old school Marxist – the dead and gone type. While he does largely represent moderate thoughts he still has remnants of stupid failed utopian Marxist traits. Guess old habits die hard! I would ignore this post by him. I like the TNA’s comment. While MRin power he removed most of the cloth from tamils. If Mithiri comes to power tamils can save their underware at least. If MR win again he will strip even the underware from tamils and sell them to chinese, so shame, shame , Harohara-I think Lord Krishna will supply cloth this time.